“A way to a mans heart is through his stomach” – My mother would always say this to me as i was growing up, she felt it was extremely important that a woman should know how to cook, to be able to look after your family, feed your children these are few things that my mother feels only woman can do she says its only us who have that kind of patience and compassion that we can look after all these people with so much love and care, that we can give them so much, so selflessly. 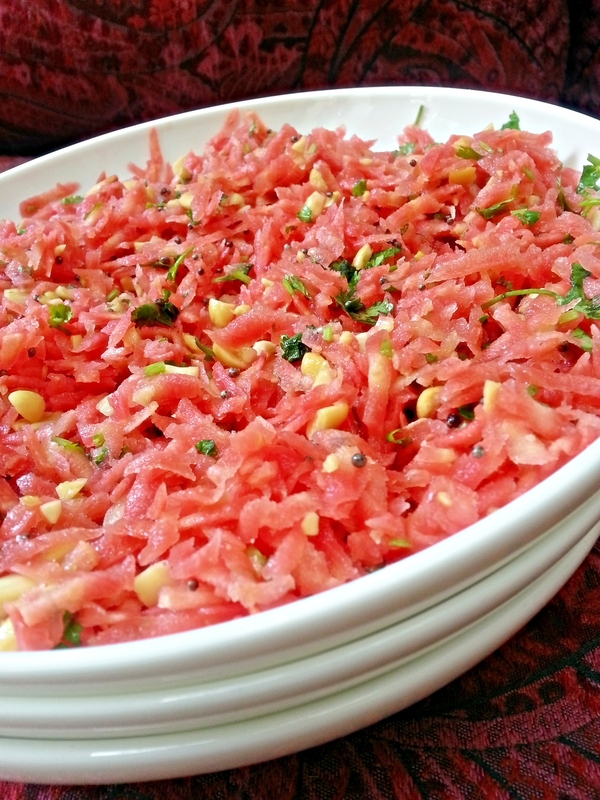 I learnt how to make this salad from my mother and now its made regularly in my house. The salad can be put together in a matter of few minutes and is packed with flavour and colour. It is extremely light and fresh and ideal with a rich meal. Shredded salads and kachumbers are extremely famous all over India and are eaten with every meal in mostly all Indian homes, you either eat them with dhal and rice or with parathas and puris they get along famously with lamb and chicken dishes too. I remember as a kid when we never wanted to eat a salad our grandmother would forcibly make us eat these salads as she considered them to be palate cleansers and said it was extremely important for our eyes and skin. I made this salad today and before it could reach the dining room my mom had already polished off half of it in the kitchen, she is a salad crazy lady and can’t live without them and her bowl of yogurt, i think a good salad , a bowl of yogurt and her yoga keep her so fit. So here is a salad that she absolutely digs in and is super easy and quick to make. Toss the grated carrots, crushed peanuts, salt, sugar, lemon juice and chopped coriander together in a bowl. Heat oil in the smallest possible pan you have. Add the mustard seeds and let them splutter for a second or two immediately pour them over the salad and mix. Taste, adjust the seasoning and EATTT…..